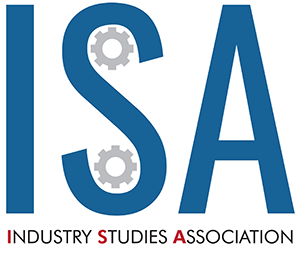 The Industry Studies Association (ISA) seeks to advance industry studies scholarship, by facilitating the exchange of ideas among its members and between its members and the general public. Our activities bring together scholars from many academic disciplines who are committed to making the kind of personal investment of time that is necessary to learn about the markets, firms, and institutions in the industry or industries they study. Conferences organized by the ISA provide a forum where research findings and methodologies can be shared across disciplinary boundaries, industries and other specializations. Communication to members and to the general public is enhanced through the ISA’s web site. Through awards for outstanding published research and doctoral dissertations, the ISA recognizes excellence and promotes awareness of findings and innovations in research methods. Many of our members are world experts on particular industries or engage in research that is critically important to a number of different industries. As such, the ISA is a resource that can be drawn upon by industry leaders, policy makers, and a wide range of related stakeholders. Our members contribute to national debates and policy decisions concerning a diverse set of issues that affect the economic well-being of peoples around the world. Because the research methodologies employed by ISA members often benefit from direct communication with industry practitioners, industry studies research often helps to inform industry practice. Our goal is to be recognized as the leading organization in the world dedicated to promoting industry studies scholarship.